Today's Why Guy question comes from ABC10 viewer MaryKay on Facebook. Walt's Why Guy question for this week centers around smoke alarms. Yeah, we've all gone room to room at 4 a.m. trying to find out which of our smoke alarms is chirping, driving us crazy. Why does this always seem to happen when we’re sleeping and defenseless? If this has happened to you, like it's happened to me, there is a reason why the smoke alarm chirping happens usually in the overnight hours when you're trying to sleep. According to the Kidde Corporation a major manufacturer of smoke alarms, it's because of room temperatures dropping. 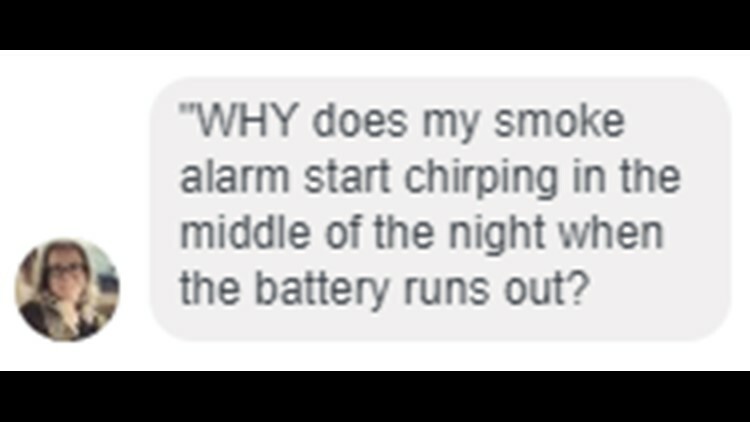 "As the battery nears the end of its life, a drop in room temperature can cause the smoke alarm to enter the chirp mode. Most homes are at their coolest between 2 - 6 a.m. That's why the alarm may sound a low battery chirp...then quit when the home warms up a few degrees." So, that's why that %^$*ing chirping happens when you're sleeping. It's the combination of a low battery and lower overnight room temperatures. Change your batteries twice a year to avoid the battery bogeyman from chirping you awake.